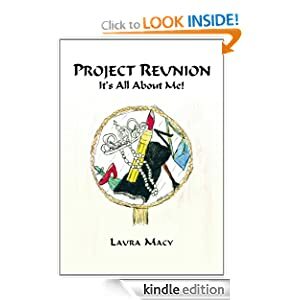 Author Laura Macy’s fictionalized autobiographical memoir, Project Reunion—It’s All About Me!, is a quirky, humorous take on preparing for a fortieth high school reunion. Readers will be able to relate to Macy’s humor and story, which highlights universal experiences, insecurities, and the need to be able to laugh about them. The book is formatted as a journal that covers the 337 days from the time that Laura receives her reunion invitation until the date of the big event. For Laura, life is all about pointy shoes, mascara, and creative beauty tricks, saving money on Botox by not frowning when she receives a speeding ticket and combining weight training, step aerobics, and housework by carrying full baskets of laundry up the stairs with her two-year-old granddaughter along for the ride. It is a fast-moving, fun book that offers a tone to which her readers can relate, keeping readers laughing from cover to cover. Ultimately, Macy’s story reminds us to approach life with a sense of humor: life is so much better if we can laugh at ourselves out loud and giggle smartly at our adversaries. Inevitably, readers will be anxious for the sequel.